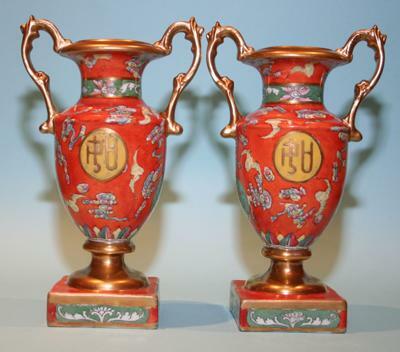 I have a small pair of Chinese vases, 20cm high, with a coral red glaze and yellow medallions with a Shou like character. I am not able to make out the blue mark on the base and would appreciate your opinion on the circa date and on the reign mark. 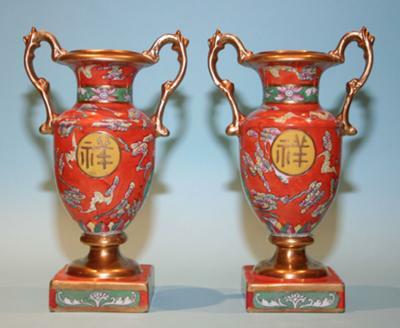 The shape is European (western); the bottom and colors are not right for traditional Chinese wares. 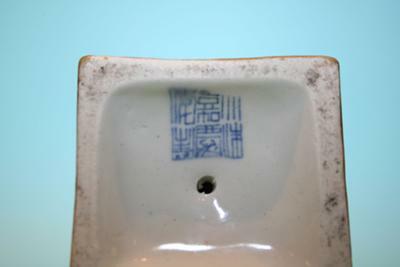 There is a Qing dynasty Jiaqing mark that possibly is apocryphal. Only the Chinese characters point to something Chinese. Overall said, to me this looks more like a modern product. Perhaps made for export?